Great article! As you say, the obstacle is getting that initial infrastructure up, but it seems we're getting a resurgence of space activity at the moment, particularly in the commercial sector. Humans will send robotic self-assembling resource factories ahead of them to build habitats and to accumulate oxygen, water, and other necessaries. Humans will definitely move into space, but machines will be sent ahead to do the preliminary preparatory work. China plans to mine the moon sometime near 2016, Russia around 2020. The US may have to ratchet up its schedule if it wants to stay ahead of its rivals. They'll have to divide up the moon like they did to antarctica! 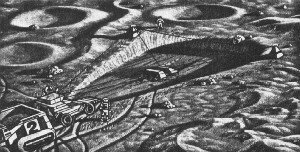 “One of NASA’s reasons for going back to the Moon is to demonstrate that astronauts can essentially “live off the land” by using lunar resources to produce potable water, fuel and other valuable commodities.” –So NASA is going to the moon for the purpose of establishing initial infrastructure, by processing essential materials from the lunar surface, which will be the key to making space more economically viable. Al fin, that’s a reasonable point about robotics. Machines are indeed being sent ahead to do preliminary work. As well as the recent lunar probes, NASA is working on a wave of lunar robotic probes that will pave the way for the human missions. However the fact is at this point in time, machines are still nowhere near the versatility of a human. Robots can more easily and economically record data and lay the basic ground work then humans can, but when it comes to the initial stages of establishing basic resource utilisation operations, for the foreseeable future, we will likely need thinking, reacting, human beings in space. It seems unlikely that within 10 years robots will equal the performance and versatility that a human can achieve. I believe manned space flight is an important and necessary aspect of establishing industrial operations. Ensuring resources and facilities for sustaining humans in space is also beneficial for future growth in space, even when robots can outperform humans. Space tourism for example, is a field of potentially massive growth if the prerequisites for sustaining people are in place. And of course NASA still wants to one day send humans to Mars, not just robots. The country that gets way out ahead on this will be the first one to send a self-replicating factory not to the moon, but to Earth! Think about it: All the resources it would need are so much more abundant here. You can even hire monkeys to do parts of the work that are expensive to design robots and software for, at a fraction of the cost. If technology is almost at the point where humans can send ships to mine mountains on the moon, then what's the big problem with sending a ship with virtually the same technology to the Himalayas or the Rockies? Why not try the ocean floor too? Countries that concentrate on space development only will fall far behind countries that apply the same principles to Earth-based industrial development. If the article meant to imply that Earth's energy problems can't be solved on Earth because it's all used up or something like that, then that's the most head-in-the-sand Peak Oil pessimism I've ever read. Not at all. If you take a look at part 1 (link in post), you’ll see that the point of industrialising space is to ensure vast growth into the future for the global economy, the worlds resource base, and eventually the human population. The subject is therefore very important in relation to peak oil, because this one field, if successful, single handedly debunks every doomsday scenario predicted to result from peak oil. This part of the series is focusing on the point that said future growth will be possible not through some colossal project to colonise space, but through a process of slowly establishing infrastructure in space. Once even simple infrastructure is established, I believe that the speed of space development will increase exponentially. what's the big problem with sending a ship with virtually the same technology to the Himalayas or the Rockies? Why not try the ocean floor too? Firstly, as this post points out, don’t think of complex Earth-like mining operations, think of low-tech approaches involving scooping up surface material and baking out valuable resources. Secondly, consider that much material found in space is largely not found in the Earth’s crust and hence extremely rare and valuable. As this post also points out, these resources are also extremely valuable because they make further activities in space cheaper (activities such as building solar satellites for clean and cheap power on Earth). Finally, consider that once you’ve got appropriate equipment on the moon or a near asteroid, extracting said valuable material is a hell of a lot easier then mining mountain tops or the ocean floor. In fact it’s probably easier then any terrestrial mining activity; getting there is the only real hard part. Getting there also happens to be something we are getting better at all the time. An interesting idea I've seen is to calculate the amount of effort required to build the Pyramids/Stonehenge/huge cathedrals etc., relative to the societies that built them, and then envision a similar kind of project in today's society. It really makes you realise how much money and effort is being wasted on wars, car accidents and so forth. I figure that if just .1% — one tenth of one percent — of the world's population and GDP were devoted to building an interstellar space ark over thirty years, that would be 6 million workers and 1.7 trillion dollars! That's a total of almost 300 billion man-hours and 50 trillion dollars, not including the growth that would happen in that time! There's no reason why we couldn't devote .1% of our resources to such a worthy project, if only we had the will. Why aren't we doing it? The future lies in space! Who was it that said we overestimate technology in the short term but underestimate it in the long term? That's because we project in a linear fashion whereas actually technology follows an exponential curve. I hope that the overestimation is over and the underestimation is beginning. Thanks! You can see the whole calculation in more detail at my blog. There is more than material on the moon in space it is unlimited. You could put large metal web balls in space to collect antimatter which make all the fusion designs possible now. Then make fusion rockets to go longer distances in shorter times. Then with faster sub-light speeds you could use brousard ram jets as a matter scoop and generate anti matter to go faster by haveing more fusion power. The material of the solar system would be possible. We would learn to warp space then then travel to the stars would be possible.